People are high on Restoration Hardware and Pottery Barn ! Back in the waning days of the fall garage sale season, I scored one of my more awesome finds of the year. It was at a yard sale at a typical suburban house in your average suburban neighborhood. The guy running the garage sale however, was anything but the typical suburban dad. Wearing a tie-die shirt and a long pony tail, he looked like he just got off the road with the Grateful Dead! Smiling broadly, he greeted me with a super friendly hello and seemed unusually happy for the hour of the morning. It was almost as if he'd just left the "smokey" confines of a Dead concert. But then again, I don't want to judge-maybe he was just a happy-go-lucky guy! After greeting him in return, I began to looked around. He had a strange dichotomy of household items for sale. The garage was filled with artsy decorative stuff and ugly wood furniture, combined with the common suburban clutter of kid's toys and clothes. But looking past the clutter, my eye caught site of something you just don't see everyday-a beautiful airplane pedal car! Measuring over four feet long with a nice wingspan and big propeller, it screamed high-end toy! The metal plane only needed a little cleaning up and a minor repair to the steering wheel. Although I couldn't place it at the moment, I vaguely recalled seeing the exact model in either the Pottery Barn or Restoration Hardware store. Wherever it was purchased, I knew the thing cost big money! The asking price was scribbled on a small sticker slapped on the wing...$50 dollars. Not a bad starting price, but betting on a hunch that "Grateful Dead Dad" was in a pretty good mood, I offered him half that amount for the plane. Surprisingly, he didn't even flinch and agreed to take my twenty five dollars. I was kind of shocked, given the fact the plane probably set him back at least a few hundred bucks! Not wasting any time, I handed over the cash and grabbed the plane before his buzz, I mean, happy mood wore off! The beautiful little airplane looked magnificent in the back of my truck! Pointing backwards as if ready for takeoff, she reminded me of a World War II fighter plane ready to be launched from a ship's flight deck! The silver prop and steering wheel sparkled in the morning sun, attracting the attention of fellow yard salers. One older gentleman even approached me at my next stop and although I don't normally waste time kibitzing, I couldn't help but take time to proudly show off the plane. In fact, the little plane turned so many heads, I thought it best to drive home and offload her before continuing to more garage sales. Not in any particular hurry to sell it, the plane sat in my garage for a few weeks. Finally, I did some detective work and uncovered the plane's origins. I discovered that Restoration Hardware sells this model, calling it the "Silver Pursuit." This made total sense because about five miles from where Grateful Dead Dad lived, once stood a Restoration Hardware store. Although the store is gone, Restoration Hardware still sells the exact plane on their website for, get this..... $500 dollars! Amazing isn't it? How could someone pay that much money for a cool, unique toy, then sell it for a little more then a twenty dollar bill? But I thank the garage sale gods for those folks...without them I couldn't do what I do! Bottle cap? Nope, steering wheel cover! Now that I knew it's value, it was time to prep the Silver Pursuit for Craigslist. Although it was in very good condition, there were some minor cleaning and repairs to do. The repair consisted of finding a nut to anchor the steering wheel to the center column, then covering it with some sort of plastic cap. Finding the nut was easy, the tricky part was searching for the right color cap to match the red seat. A trip to Mrs. Dude's kitchen solved that. I found a red bottle cap to match the seat and hot glued it over the nut...a perfect fit! With the repairs made, the Silver Pursuit could now take off on Craigslist! I posted the plane on Craigslist in early December hoping to capitalize on the Christmas buying season. Beginning with a way-high price, I slowly dropped it after a few weeks with no interest. But about a week before Christmas I finally parted with my beautiful toy plane, selling it to a grandfather for $150 dollars! He bought the plane for his grandson-a better Christmas gift I could not imagine for the lucky grandson! Everyone was happy with this deal...the seller, me, the grandfather and of course, the grandson. For me, not only was this a profitable flip, but it was just a blast preparing the "Silver Pursuit" for resale! As they say after every successful military flight....mission accomplished! 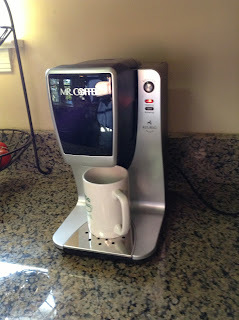 Starbucks, Keurig and Mr. Coffee at a low, low price! Not long ago, I blogged about a lady who picked up a Keurig coffee maker for next to nothing at a garage sale. What bugged me most is she intended to use the machine to only brew hot tea, claiming she was not a coffee drinker. I couldn't help but be aghast and a little jealous that a perfectly good Keurig machine would be wasted this way! Maybe my deep seated resentment had something to do with the fact that I hadn't scored a Keurig machine of my own? If so, I can now stop complaining because I finally scored a Keurig! About a month ago, I happened upon this sweet Mr. Coffee machine at the local Goodwill store. Although it says Mr. Coffee, it's actually made by Keurig. The machine looked like it was never used and included the original box with the instruction manual. There's no multi-cup tank reservoir in this model. Instead, it brews one cup at a time-not a big deal. I am guessing the machine was probably a Target store return. Target donates a huge portion of their unsold inventory and returns to Goodwill Industries. This coffee maker clearly seemed to be one of those donation/returns. I definitely didn't pay Target prices though. This machine cost me only $8 dollars! A pretty good deal, considering they retail for $80 or more at many stores! Once I got Mr. Coffee home, I plugged it in for a test run. Pouring a full cup in the upper tank, the water heats up after just a few minutes. A light signals when it's ready to brew. At the push of a button-boom....out pours a fresh cup of coffee! Any residual water in the tank quickly evaporates from the heat and you can start brewing all over again. Current models like this sell on eBay for around $70 big ones! As a guy who makes some nice bucks flipping thrift store finds, I was faced with a difficult dilemma. Do I keep this awesome coffee maker and enjoy it, or sell it on eBay? Oh the agony! It's a tough call but I think I am keeping it..it's just too nice! Mmmm, can't you just smell the coffee? Further reinforcing my decision to keep the coffee maker is this great little Starbucks coffee cup. This smallish cup holds 7.8 ounces of caffeine happiness! I found a set of two at Goodwill, each marked 49 cents a piece. Naturally, I looked them up on eBay. They list for about ten dollars a piece on the auction site. But like the Mr. Coffee find, I decided to keep these little guys. They're just the right size for my morning cup of Joe. Not to mention a little change in kitchen dishware is a good thing. I've grown tired of using our collection of big heavy mugs. Those monsters take up a huge piece of real estate in the kitchen cabinet and give your biceps a workout just hoisting them! The decision to keep the cups wasn't automatic though. When I brought them home, Mrs. Dude gave me the push I needed to resist the natural inclination to sell them on eBay. She voted to keep the cups, adding she tried to find something similar to give me as a Christmas gift. With that green light, I proudly placed the cups into the dishwasher. Once purged of any Goodwill dust and dirt, these guys were going right next to the new coffee maker! I think I made the right decision to keep them. What do you think? The North Face Jacket is everywhere ! When out with family, I can't stop myself from people watching to see what the latest fashion trends are. Sneakers, coats, hats...I figure if it's popular, maybe I can make some money from the trend! For example, a few days after Christmas, Mrs. Dude and I went to the movies. Arriving early, we had some time to kill before the movie started, so we sat at a table in the lobby area. Clutching my large bucket of popcorn, I watched the moviegoers stream in and out of the 16 screen Multiplex. As I munched popcorn, I began to take notice of the unusually high number of people wearing North Face jackets. While many were high school and college kids, there were also a fair amount of "adults" wearing the jackets too. The coats are easy to spot-most are black with "The North Face" stitched in white lettering on the upper chest. Since it was just a few days after Christmas, I surmised that many of these coats were probably holiday gifts. Continuing to shovel popcorn in my mouth, I began to conduct a head count of North Face coats as movie patrons walked by. I'll admit I was never the greatest math student, but my inexact survey revealed that for roughly every four people walking past me-one was wearing North Face. I didn't need to count on my fingers to determine that works out to be a 25% average! Armed with this fun fact and a mouth full of popcorn, I struggled to verbalize my findings to Mrs. Dude. She agreed with my garbled conclusions, but warned me to cool it with the popcorn, less I run out before we even got inside the theater! Fortunately, the popcorn did last for the start of the movie. But more importantly, I learned from doing some people watching that North Face continues to be as popular as ever! While I already knew kids really liked them, the high number of adults sporting North Face was equally as impressive. Although, sorry to say, this could be the kiss of death for the North Face fashion trend. Think about it-what kid wants to wear the same brand of coat mom and dad are wearing? But that's a discussion for another day. For now one thing is for certain: Due to it's popularity, North Face is a great item to look for at thrift stores and garage sales. Here's a perfect example-I found this North Face backpack at a yard sale for one dollar! You read right...one dollar! It was sitting next to a JanSport schoolbag, which was also a dollar. I bought both, but had a feeling the North Face would sell for more. (I was right.) No time was wasted in posting this backpack. Although school had already started weeks earlier, I knew that wouldn't get in the way of a great auction. True to the brand's popularity, my dollar North Face find ended up selling for an amazing $45 dollars! Although I eagerly await the day, I still have yet to find a North Face coat. 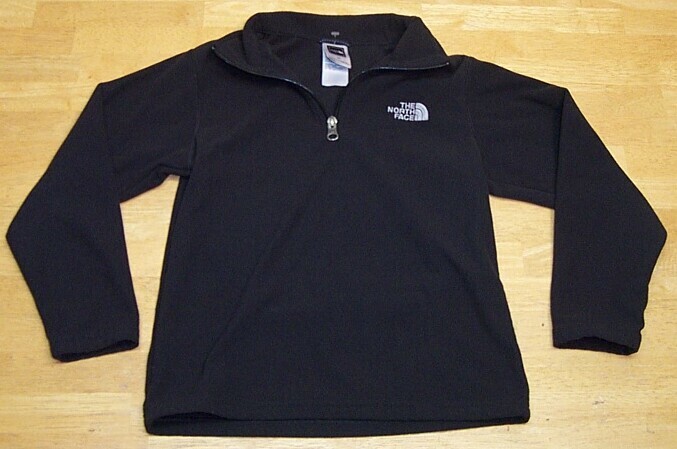 But I did find the next best thing-this North Face pullover jacket. I acquired the pullover at the Goodwill store, buying it for only $3 dollars. Once again wasting little time, I immediately posted the jacket on eBay and sold it at auction for a solid $28 dollars! This kind of positive reinforcement is not helpful when my daughter wears her white North Face coat. When I see her with the coat, I can't help but wonder what I could sell it for on eBay? That's what happens when you're in this business-everything you see is a potential sale....it's a blessing and a curse! So next time your out and about, make sure you take notice of what people are wearing. In my case, even when out stuffing my face with popcorn I learn few things! Today is the Feast of the Epiphany, considered the end of the Christmas season. I am ready to move on, as I'm sure you are too. But before we leave the holiday season, I have one more Christmas story to share. It's a little different because I actually lost money on this deal. But I am very okay with it. About a month ago, I spotted a life-size Santa Claus at the Goodwill store. He was made up of two separate pieces-legs and upper body. Judging from his vintage appearance, I could see he went back more then a few years. His price was written on the outside of the box-a steep fifty dollars! Despite the high price, my juices were flowing on this great old find. But with only a few weeks to go before Christmas, I wasn't sure if the hefty investment was worthwhile. So I did what I usually do when I can't make up my mind. I paced around the store while weighing the pros and cons inside my head. Hoping some quick eBay research could help me decide, I clumsily plunked at the keys on my phone searching for similar Santas'. There were a few listed, but price depended on condition. The condition of my Santa was not the best. My other potential problem was storage. If I couldn't sell the big guy, I'd have to find a space for him in my crowded attic. Still unable to decide, I did something I never do at Goodwill-I approached the manger and asked if she would go lower on the price? Surprisingly, she agreed and came down to $40! (Maybe because I am a loyal customer.) Having now called my bluff, I couldn't back out....Santa came home with me! He went to a good home! Now the proud owner of a vintage Santa Claus, I conducted my usual research to try to find out his provenance. Given his size, I was curious how he was displayed back in the day. His suit was real fabric, eliminating the possibility of him being displayed outdoors. Being life-size, he also seemed too big for people to easily display inside their home. Surfing eBay listings, I concluded he was about 50 years old and most likely used in department store window displays. This would explain his life-like beard and fabric clothing. Only a few of these guys were listed on eBay, but one in near-perfect condition sold for $600 dollars! Although my Santa was not nearly in the same pristine condition, I thought $100 would be a reasonable amount to ask for him. With just a few weeks left to go before Christmas, my Santa went up on Craigslist for $100 dollars. But it seemed buyers were not in the holiday spirit for old Santa. I received no e-mails! I then lowered him to $75....then to $50. To my dismay, still no inquiries on old Saint Nick! As Christmas day past, I began to think that maybe it wasn't such a good idea to have bought the jolly old fella. But before the big guy headed upstairs to my attic, I decided to lower him once more to $30 bucks. That was ten dollars less then what I paid for Santa. Some wheeler-dealer I was turning out to be! But I reasoned if I didn't get him sold now, I'd have to wait until next year! But then, just about the time when Santa was heading to the attic, I received an e-mail from a guy named Phil. He said he wanted to buy good, ol Santa! I met Phil the next day, which happened to be New Year's Eve. He pulled up in his flatbed truck 15 minutes late. I smiled to myself as he jumped out of his truck and apologized for his tardiness. He had a scattered, haphazard look about him and seemed like he was probably late for a lot of appointments. Propped up in the cargo area of my car, I opened the rear door for Santa's big reveal! Marveling at the jolly old fellow, Phil handed me thirty dollars with no questions asked. As he paid me, I began to talk about how this Santa was a great, old collectible piece. Phil humored me and listened, but then told me what he really wanted the big guy for. It had nothing to do with the usual reasons, like collectible value or use as a holiday display. Phil told me he bought Santa Claus for his mother-in-law, explaining she suffers from Alzheimer's disease. While she doesn't respond to too many things anymore, Phil said her eyes brighten and she smiles when shown pictures of Santa. Seeing her reaction, Phil decided his mother-in-law deserved her own full-size Santa Claus! Now I ask you....how great is this guy? He met me in a parking lot on cold, dreary New Year's Eve just to make his ailing mother-in-law a little happier. Now that's what I call a "Prince" of a son-in-law! I have to say, sometimes you meet the nicest people in this business! With that, Phil gently buckled Santa into the passenger seat of his truck. I wished Phil a Happy New Year and told him I hoped Santa would bring some joy to his mother-in-law. As Santa happily looked out the front window of the truck, Phil pulled out of the parking lot and headed home. Call me crazy, but as they drove away it seemed like Santa couldn't wait to meet his new friend. Vintage Walt Disney toys should sell much faster then this! Do you have patience? You definitely need some when selling on Craigslist! Don't get me wrong, there's plenty of advantages to Craigslist, such as no listing fees, shipping costs or stupid feedback! But a big disadvantage is dealing with those "maybe" buyers who never follow up. As a seller, it takes real patience sometimes! I've complained about this phenomenon in previous blogs. The whole process reminds me of fishing-just because you've hooked em, doesn't mean you're gonna get em in the boat! Who's the leader of the club that's made, ahhhh...you know the rest! This vintage Mickey Mouse Club toy cart is a case in point. I bought this at a yard sale back in October. I thought it was a pretty good find, particularly since I discovered it late in the morning. That's normally when the good stuff is already gone. I lucked into the toy cart however, after the buyer brought it out late in the day. Fortunately, it was just about the time yours truly happened upon the sale. Knowing there's plenty of Disney collectors out there, I decided to buy the cart if the price was right. The seller was asking ten dollars, but agreed to come down to eight. After I paid her we had a nice chat. She told me the cart was used by her son when he was a kid. Her "kid" was helping mom out at the garage sale. Glancing over at him, he looked to be in his late-fifties, confirming to me that the cart was the real deal. I bought a few more old toys from her, then stowed everything in the back of my truck and headed home. I was pretty happy about the Disney cart, figuring it would be an easy re-sale for me. After some gentle cleaning, I posted the toy cart on Craigslist for a very reasonable $50. It was early December and I hoped someone would buy it for a Christmas gift. Being a wild-eye optimist, I thought it would be only a matter of days before the cart was sold. I was off by about six weeks! Initially the only inquiries I received were from those classic, non-committal CL buyers. At least three separate would-be "buyers" assured me they'd buy it tomorrow...or the next day...or the upcoming weekend. All were no-shows! Like I said, it takes patience. Finally, after six weeks of these broken promises, I received an e-mail from "Cindy" who told me she definitely wanted the cart. Of course l'd heard that story before, so I e-mailed her back trying to quickly commit her to a time and place to meet. To my surprise, she agreed and we met on the following day. I pulled the old cart out of my truck and without even bothering to look at it, Cindy forked over fifty dollars! Having now safely landed that sale, I decided to try to push my luck further. Since Cindy was a Disney collector, I brought along a beautiful framed print of Walt Disney with Mickey Mouse. Ironically, I bought the print just down the road from where I picked up the toy cart. Pulling the print from the back of my truck, I have to admit I felt a little shifty, like some old traveling salesman selling vacuum cleaners or aluminum siding out of his car! Balancing the huge print on my shoes and grinning like a fool, I asked Cindy what she thought of it? She tilted her head slightly to admire it, then gave me a promising, "Awww." But then the moment was over. While I almost had her, she politely declined explaining she had no place to hang the print. I also think my price of $100 was just a little too high for her. Believe me, I think the print is worth every penny, but ya win some and lose some! It may not be a total loss however. Cindy said she'd tell a few of her Disney collector friends about my awesome print. So there's hope yet! Either way, I was happy to finally get the toy cart sold with a profit of $42 dollars. It was a royal pain dealing with those Craigslist "maybe" buyers, but after six long weeks the Disney magic finally worked!